I brought this cheesecake to my uncle's housewarming party last Saturday. My aunt took a look and said "I think I've seen this cake before, with the cow-pattern. Wasn't it on TV recently?". Yes! It was on Destination Flavour Japan on SBS. "The show with that Adam Liaw guy from Masterchef..." she says. I was thinking, gee, she must have REALLY wanted to eat that cheesecake to have remembered it so well. I guess it is a rather unique-looking cake. And it tastes absolutely heavenly. Velvety smooth and silky, not too rich, not too sweet. It's really the perfect cheesecake. 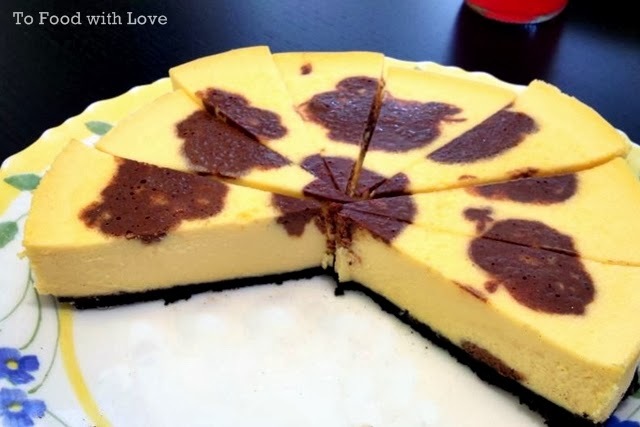 It's the Choco Moo cheesecake, made popular by Farm Design Hokkaido Cheesecake. What makes this cheesecake so special is the use of Jersey milk that has high butterfat content, although you can also substitute with regular milk. The inside of the cake has little balls of chocolate ganache. The chocolate really shouldn't be oozing out like the picture above. I didn't let it chill long enough before slicing into the cake. I mean, can anyone out there who's made cheesecake before admit that they could actually wait until the next morning (or even a few hours) before cutting into the cake? I didn't think so.